If you have an abundance of zucchini from the garden try making this nice summer dish. You can eat this warm or at room temperature as a side dish. It also works well as a salad. Place oil in a frying pan on medium heat. When oil is hot add onions and cook 3-5 minutes until golden. Add garlic and cook 1-2 minutes to soften. Add zucchini, pepper flakes, salt and pepper. Sauté for 5 minutes until crisp tender, stirring occasionally. You should be able to put a fork through the zucchini but you do not want it soft or mushy. Transfer vegetables to a serving dish. 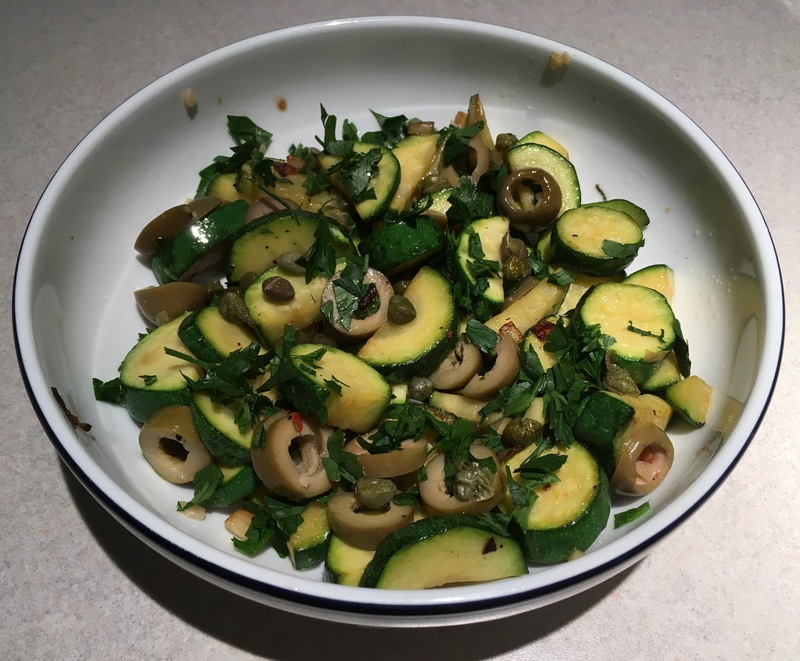 Sprinkle with olives, capers and parsley. Toss. Taste and add salt if needed. Drizzle with a little extra virgin olive oil. Serves 2-4.